In our previous blog, we mentioned how tracking your referrers may lead to traffic success. If you follow the advice, the reports can become the top factor for better understanding your audience. Here’s a short guide on how to make use of referrer data provided by Piwik PRO in order to drive more traffic to your website and enhance your ranking in search engines. Let’s dive in! First of all, we need to remind you the number-one rule when it comes to analytics: You do not read your reports; you interpret them! You cannot absorb the data just taking it at face value; you must look for a reason instead. Keep that thought in mind and study our short guide on how to take advantage of your referrers panel. 1. You can monitor unexpected spikes in web traffic. The referrers panel should be the very first place you look when there is a great jump in the visitors log. Those reports allow you to identify sources of traffic so you can optimize and enhance visits on your website. When one source suddenly outperforms others, there must be a reason for that. Look into it and try to draw the right conclusions. 2. Tagging campaigns helps measure marketing performance. To understand how well your marketing efforts are doing, take notice of the Campaigns tab. You should tag every CTA in your newsletters, buttons on your landing pages, and links on social media leading to your websites or whitepapers etc. If you do not tag your campaigns, your analytics tool may suggest that your email campaign, for example, is a direct entry to your website, which credits conversions and transactions on your ecommerce site to the wrong channel. 3. Link-building campaigns help with SEO. When you find companies or blogs that seem to be dealing with matters important to your business, you might consider forging a relationship to cross-promote your content, especially if they brought you traffic in the past. Those may be your customers, influencers, bloggers, or any sites related to your niche. Having links to your website around the Internet enhances your SEO ranking. Marketers attribute a great part of the engines’ algorithms to linking. In general, if many other blogs or sites link to your website, search engines perceive it as a reliable source of valuable information. Therefore, linking may increase the popularity of your content. It is a great way to build brand awareness and hopefully generate new leads. Start by reaching out to the particular sites you would like to collaborate with and consider establishing affiliate programs. It will be easier to achieve if you make sure your content is consistently of value to your audience. 4. You can track keywords bringing the most traffic from search engines. Knowing how many users reached your site by entering your exact company name is valuable information, as it may reflect awareness of your brand. On the other hand, you can also see which keywords are the most popular for your website. You should consider optimizing your content according to the keywords that brought the most traffic or that attracted visitors who converted into sales leads. 5. Your paid search ads are doing better than they seem. It is obvious that your visitors surf the Internet from different devices and locations. You shouldn’t be surprised when one person enters your page from an office computer, and a few hours later makes a purchase from private laptop. Your analytics tool will record it as two different visits and suggest that it was a result of direct entry to your site. Still, you should take into consideration that it may not be entirely accurate. When implementing any campaign, remember to look at general increase of revenue. Only in a few cases will your customer buy any goods right after the first entry on a website. 6. All marketing channels affect each other. If you notice that your social media channels do not perform well, it doesn’t mean you should abandon the whole idea. Every single channel you invest your resources in may contribute to higher conversion rates. Social media messages can help build awareness of your brand, which is the beginning of your buyer’s journey. Assess the real impact of each channel in the campaign you’re running. Splurging on social advertising may not immediately lead to more sales, but in the long-term may prove useful, as more people come to know your offering and with time can become your paying customers. You need to determine if the medium is accurate for your audience, track the number of visits and link clicks, and take advantage of advertising possibilities. Give yourself some time, as getting the big picture may take a while. There are also potential problems that can crop up when tracking traffic sources and referrer paths. To fully understand your data, awareness of these issues is indeed recommended. You may have noticed some shady URLs when going through your logs. That is referrer spam – fake referrers pointing to spam advertising websites. The spammers’ main aim is to build traffic to their site, as curious webmasters are likely to visit their referrer. Moreover it is supposed to improve spammer’s SEO. Public analytics reports will be indexed by search engines like Google, which may lead to a higher position in search results. If you regularly update Piwik PRO, then you’ll have nothing to worry about, as referrer spam is automatically excluded from your reports to keep your data clean and useful. However, it is still a common problem among analytics tools. Another issue is that Google does not disclose entered keywords for logged users. It can be a real struggle if you don’t have enough traffic on your website. Annoying as it is, be aware that you aren’t the only one to deal with the “keyword not defined” problem. Some referrers may also stay invisible because of security and privacy policies respected by Piwik PRO. Remember to adjust Piwik PRO’s privacy settings for compliance with data-protection standards in your country to keep your clients and employees’ data safe. 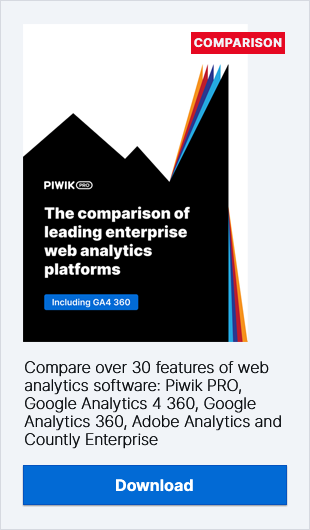 This step may affect your reports and be one of the reasons for discrepancies between Piwik PRO and other analytics tools. Knowing that, it may be tempting to omit this one. Privacy standards are often strict and robust, but there is nothing more valuable than trust and safety of your stakeholders. Follow this article to configure your analytics for privacy. Referrer reports may be tricky without careful and proper interpretation. By following our tips you can be sure you do not misunderstand the data provided by your analytics tool. For more information check out our Referrers User Guide.